This is my other adorable niece, Phoebe. 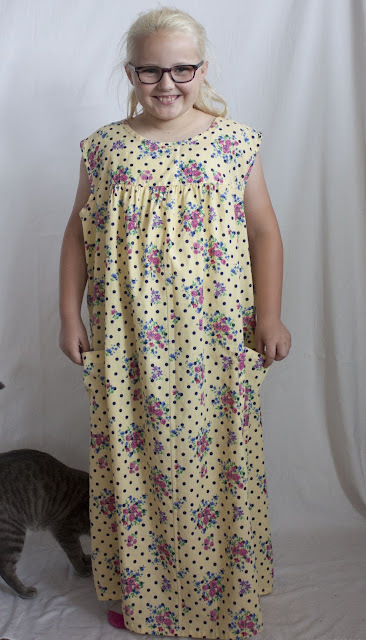 This little lady was nice enough to let me refashion a dress just for her. I think she was kind of nervous/confused when she put the first dress on too, but she was a good sport! 1. Cut the dress to her length (about 20 inches off), zig-zagged the edges and hemmed it. 2. Tapered in the bodice area to fit. 3. Moved up the pockets. Unstitched and restitched into place. 4. Made a little belt out of the excess fabric. This dress is great because it can be worn as a looser shift dress or with a little belt to be little more girly. More refashions and vintage on my instagram here! Such a beautiful girl . Her smile is enchanting. You are lucky to have such great young models.